Lore and Saga. Chronology from Big Bang to Domesday. Stone Age. Copper Age. Bronze Age. Iron Age. Celts. Romans. Saxons. Vikings. Normans. 15,000,000,000 BCE The Universe goes BANG. 4,600,000,000 BCE Some bits start to hang together and become the Solar System. 4,500,000,000 BCE. a small lump becomes the Earth. 3,500,000,000 BCE some molecules stop being dead and become Life on Earth. 10,000,000 BCE Ramapithecus, oldest known primate with “man like” traits, evolves in Africa and India. 2,400,000 BCE Homo habilis, the first true “man” appears in East Africa. Nick named “Handy Man“ because he makes and uses simple stone “pebble tools”. 2,000,000 BCE Homo erectus, the second member of the genus “Homo” turns up about this time and for the next million years is the real innovator. 1,500,000 BCE Patches of baked earth suggest that Homo erectus may be using fire. 1,000,000 BCE Ancient hearths tell us that Homo erectus has definitely got the hang of fire by this time. About this time boats of some kind are being used to cross substantial bodies of water. 400,000 BCE Homo erectus enters the housing market with oval huts in France. 300,000 BCE Neanderthals turn up in Europe and stick around for about the next 260,000 years. Better equipped than Homo erectus but not as adaptable as Homo sapiens to come. 90,000 BCE Homo sapiens, modern man has arrived on the scene. 40,000 BCE Houses built of Mammoth bones in cold climates. 24,000 BCE First known use of ceramics in Eastern Europe. 20,000 BCE First known Bone or antler needles suggesting that clothing is now being sewn together. 10,000 BCE Mud brick buildings are built in Jericho. 8,000 BCE Copper is first worked from natural nuggets worked like soft stone not cast. Meanwhile stone is being used to build houses in Syria and Beer is being brewed in Mesopotamia. 7,000 BCE In Jericho someone decides to stick the bricks together with mortar. 6,000 BCE The earliest known woven cloth survives from the early city of Catal Huyuk. 6,400 BCE Copper is melted and cast in Turkey. 5,000 BCE Wood is used for construction in Germany and Reeds in Iraq. 4,500 BCE Copper ore is mined and smelted in Egypt, stone buildings are constructed on Guernsey and oak dug out canoes are used on the Seine, France. 4,000 BCE Earliest evidence of Iron beads in Egypt also they are smelting Gold and Silver ores and making boats from joined planks of wood. In the Ukraine horses are being ridden. 3,700 BCE First use of bronze in Egypt. 3,500 BCE Copper is being produced in Europe and wine in the Middle East. The wheel and the sail come into use at about this time. 3,300 BCE A man walks up a mountain in the Tyrolean Alps and is found 5,500 years later preserved in the ice. Nick named “Oetzi the Ice Man” his possessions tell us an incredible amount about the materials and technology of Europe at this time. 3,000 BCE The “Bronze Age” begins in the Near East and Sumarians begin to write on clay tablets. Meanwhile in the Orkney Islands a farming community starts to build stone houses with stone furniture and whalebone rafters at Skara Brae. 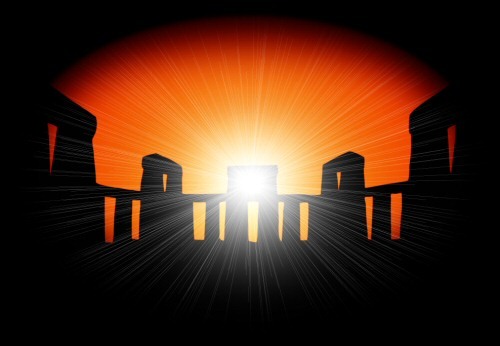 2,800 BCE The temple complex at Stonehenge is started at this time. 2,600 BCE The first step pyramid is started in Egypt. 2,200 BCE 80 Bluestones in two concentric circles are erected at Stonehenge. 2,000 BCE The first man made glass is produced at this time and the bellows are invented. It is another 400 years before they are used in glass making and metallurgy. Bronze is being cast in Stone moulds and may have been so for 500 years by this time. 1,500 BCE Iron is smelted in Armenia to produce a “bloom” and “Lost-Wax” casting is developed in the Near East. The first form of “alphabet” in Syria, the earliest surviving sundial from Egypt and Stonehenge reaches its present form. 1,400 BCE The Hittites make wrought iron by forging it from a bloom. The first Water Clock in Egypt. 1,200 BCE Iron is in common use by this time in the Near East so this is the beginning of the period commonly known as the “Iron Age”. Troy falls to the Greeks ( 1183 according to tradition ). 1,100 BCE The rotary Quern is invented for milling grain, before this, grain was ground in a saddle quern or a mortar and pestle. The spoked wheel reaches Europe. A form of compass invented in China. 750 BCE Rome is founded ( April 21, 753 BC according to tradition ). 700 BCE In central Europe a collection of Indo-European tribes gradually evolve into the people commonly now called the “Celts” and called the Gauls by the Romans. Iron is now being produced in large scale manufacturing centres such as Hallstatt in Austria. 500 BCE Rome wins it’s independence from the Etruscans and becomes a republic. ( 509 BC according to tradition ). Iron working is now common in Germany and Scandinavia. 450 BCE The “Iron Age” arrives in Britain. 400 BCE Rome is sacked by the Celts. 300 BCE Cast Iron invented and Lodestone noted to point South in China. 107 BCE Marius reforms the Roman Army. 55-54 BCE Caesar invades Britain. 27 BCE Octavian seizes power. The beginning of the Roman Empire. 43 CE Claudian Conquest of Britain. 59 CE The most sacred groves on Mona ( Anglesey ) were destroyed to suppress the Druids. 61 CE Boudiccan Revolt in Britannia destroys Colchester, London and Verulanium. 80 CE A magnetic spoon is used as the first magnetic compass in China. 122 CE Building of Hadrians Wall begins. 295 CE Library of Alexandria destroyed by Roman army. 368 CE First Saxon raids on Britain. 390 CE Library of Alexandria destroyed by Christian mob. 400 CE Chinese make steel by forging cast and wrought iron together. 407 CE Roman Legions withdrawn from Britain. 410 CE Rome abandons territories in Britain and Gaul. 410 CE Rome is sacked by Alaric and the Visigoths. 449 CE Start of Anglo-Saxon Invasion from Denmark and Germany to Britain. 500 CE Fall of the Western Roman Empire ( according to tradition ). 650 CE Library of Alexandria destroyed by Muslim army. 772 CE Charlemagne begins “Convert or Die” Campaigns against the Saxons and Destroys their most sacred site “Irminsul.” Saxons unite as never before. 782 CE Charlemagne massacres 4,500 bound Saxon prisoners at Verden earning their bitter and enduring hatred. 789 CE First Viking raid on England ( Portland ). 793 CE June 8th Viking raid on Lindisfarne. 800 CE Vikings establish permanent settlements on Orkney and Shetland. 800 CE Charlemagne ( Charles the “Great” ) organises coastal defences against the Vikings and is crowned “Emperor of the West” by the Pope. 830 CE Viking raids Increase in frequency and strength. 845 CE Paris pays the first “Danegeld” to the Vikings to break their siege. 860 CE Vikings discover Iceland. 862 CE Viking kings in Novgorod and Kiev. 892 CE Erik the Red discovers Greenland. 995 CE Olaf Tryggvason starts to convert Norway and Iceland to Christianity by the sword. 1002 CE St. Brice’s day massacre of Danes living in England. 1013 CE Svein Forkbeard of Denmark conquers England. 1016 CE Knut the “Great” unifies all England and Denmark. 1028 CE Knut adds Norway to his holdings. 1030 CE Sweden joins Knut’s “Empire”. 1035 CE Death of Knut. 1066 CE The Norman invasion of England.